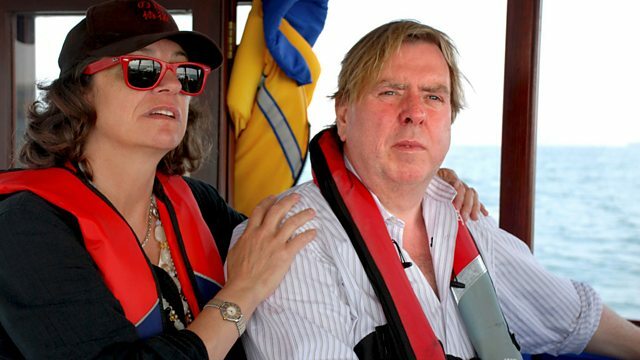 Timothy Spall and his wife Shane sail around the coast. They set off in their barge from Fowey in Cornwall, heading towards Land's End and then south Wales. Browse content similar to The Call of the Sea. Check below for episodes and series from the same categories and more! The sea is a leveller. If you weren't afraid of the sea, you'd be a fool. If this gets considerably bigger, we're going back. I'm taking on the sea. because I've never had a lesson. I've learned it all from kids' books. Learn to Navigate - An Introduction For All Ages. That's how I'm learning how to go round Britain. I'm the captain, and my wife Shane is first mate. but together we're exploring our own country. This kind of boating is the glory ship, you know? this is where the cobwebs get blown away. your own country by sea. It all started when I was trying not to die. It was 1996 and I was seriously ill, dealing with leukaemia. I started reading boating magazines. "we're going to get two things. "We're going to get a Rolls Royce, and a boat." and a small narrow boat. For eight years, our narrow boat was our second home. getting used to life on the water. I fell in once just trying to push it off. Then I fell in Oxford canal, fell in the Thames. but I did start to feel the call of the sea. We found a specialist boat builder who would make us a barge that was capable of going on the sea. And one that was big enough to live in, because this would be our home. Everything, even the furniture, is handmade and custom-built. Give the owl a wash. The Princess Matilda is named after our granddaughter. -Do you want sardines, Timmy? We spend all of our spare time here. It's our home, that's what it is. Wherever we go, we're at home. -The life of the idiot mariner! to navigate our way around Britain. So far, we've got as far as Cornwall. Let's be clear, this trip is not about speed. Well, it can't be in this boat. and up into Wales, before winter. so when I get there, I feel like Marco Polo. a town that's been the start of many an adventure. Medieval galleons sailed into battle from here. Thousands of US troops launched from Fowey on D-day. I go nowhere until I've plotted my course. -You're not interested in the slightest. because she thinks I know what I'm doing. I suppose I must know something, because we've managed to get here. Of course I trust you, you're my husband. I can still be an idiot. It's famous for eating boats. Eating them and spitting them out. when it was a bit windy, and they nearly capsized. while I go off to shoot a film. I hope to take on Lizard Point when I return in the height of summer. Now, if I can only get the hang of my instruments. in this map, if you look carefully, it's going across land! It will take us up to six hours to get to get to Falmouth. what it's going to be like when you get out there, at sea. The visibility is, I'd say this was poor to moderate. Looks like there's a patch of fog here, look. Something eerie about a flat sea, isn't there? This, this is unbelievable. I've never known a sea as flat as this. The sky and the sea are the same colour. It's like being in a dreamscape of some kind. so you've got to keep your eyes peeled, so we don't crash. But he won't crash, though. I love the solitude of going to sea. But this time, we're not alone. and a bloody great battleship. It's going at a fair old speed. Getting closer by the second. I tune our radio into their channel, so I can work out what they're up to. I heard a foreign accent saying something about firing. look here - Firing Practice Area. We're over here, look! Just when I was saying things were getting dull. We're going to be blown out the water. the battleship turns around and clears off. I think it's against military policy to pick off people in pleasure boats. But you never know. On a bad day...? to export Cornwall's rich supply of iron and clay. for tankers from all over the world. the picturesqueness, but they also have a commercial function. But we're here for Falmouth's other thriving business, marinas. with pontoons and easy access to town. The ideal place to leave Matilda for the next six weeks. If I can get through all these bloody yachts. Oh! That was a bit close! I'd better keep concentrating. And then we're going to go and try find a marina. There is one up the end here. I haven't booked ahead. I don't think I need to. I'm sure Lady Luck will be kind to us. Hi, Falmouth Marina, this is Princess Matilda. We're hoping that you might have a berth for us tonight? We're a 52-foot Dutch barge, over. 'Princess Matilda, um, no, I'm afraid we don't. You really don't have anywhere at all, over? but as Falmouth has three marinas, our luck may still be in. Hi, we're looking for a mooring for a 52-foot barge tonight, over. Oh, Port Pendennis. Thank you. Have you got any suggestions? They can't get us in Falmouth Marina, over. Yeah, well so much for Lady Luck. There's no room at the inn for Princess Matilda. Hi, Harbour Radio. This is Princess Matilda. either in Pendennis or Falmouth Marina. Have you got any suggestions for us? Over. This is going to be fun, darling. This IS going to be fun, isn't it? we're about to moor up in the port equivalent of a campsite. which is a bit like threading a needle. We always argue when we do this. He just comes and gets involved. No, it's all right. Don't break your back, love. -All right. Let it go, then. No, hang on a minute! If it starts pulling, let it go. Aren't we supposed to put it through that hole? We're attached. We're on now. We're on. -I didn't, you did it. and we can't leave Matilda out here with the tankers for six weeks. But Falmouth isn't all industry. to a place called Helford River. it's a flooded valley with several creeks. that used to operate here. Tucked into the banks of the Helford are small villages. Many are easier to reach by boat than car. Nowadays, most of these places are holiday homes. But we've brought our holiday home with us. but it's a place fit for our Princess. And it comes with its very own pearls. and every bit of mud is absolutely covered in oysters. he's obviously got his oysters. If I liked oysters, I'd be out there with me knife. I think they belong to him. We're going to leave Matilda here while I go off to work on a film. a prime time to face the Lizard. in Cornwall, and we're calling it the river of entrapment. Because we can't get out of here. I've returned from filming during one of the worst summers on record. Certainly not the weather to go round Lizard Point. In one of these books here, it says, "If in doubt, don't go." the best possible advice you could ever take. I don't want to be in 10ft waves in this. Because this'll be going like that. You know, I've got some wine, I've got some decent wine! I don't want to lose it. -I ain't that stupid, I'm not going round there. Of course we're not going to go round there. The bad weather sets in for weeks. because if it carries on like this, we'll be stuck here for winter. so thank you very much, we ain't going out there. -And wind - force five to seven. These things tell you what a force one is - "Wind, light airs, easy ripples. "Three - gentle breeze, crests begin to break. "Force six - strong breeze, large waves, extensive white crests. "breaking white foam in streaks. "Force eight! Moderate high waves, spindrift white foam! You don't want to be in anything other than a bloody five, mate. It's a wonderful place to be trapped. But we're beginning to get a bit Helford-River crazy. -Cor blimey, woman, I've done it 1,000 times! One thing the weather can't stop us doing is exploring on land. enjoy messing about in boats. You couldn't get more quintessentially British or English than a regatta, you know. Fifth prize is for the goose, which is orange 31. There's a banana now, a banana. -Are you racing today, you two? -YOU have been on TV. -And YOU are going to go in a boat. -Are you going to win? but the Helford Village Regatta is the final one of the season. So they try to end the summer in style. Look! It's a spatchcock pig! -I can, it makes me starving. Stop it, Timmy, I'm not going to do that washing now. Soon, Helford's population will halve. That's when people leave their holiday homes to go back to work. So today is all about having a good time. There goes the Royal Navy. I think they fully intend to sink, don't they? I love Britain, I love it. I just think it's a fantastic, diverse microcosm of the world. It's absolutely...this is England at its best, isn't it? 'The day after the regatta, it's like someone turned the light off. 'And we felt like that we were left over from the party. The wonderful thing about England, isn't it? How many different shades of grey there actually are in an English summer. I can count 28 up there. that's famed for a fig tree growing out of its walls. and if the weather stays like this, we might be here for that long too. I don't know, where's the fig tree? It's growing right out here, look. It's growing out the wall of the church. Here, look. At least eight inches in diameter. we stumble on places that have something special about them. Something that's hard to describe. This really shouldn't be seen for public consumption. It's such a beautiful place, and there's absolutely no-one around. It's like we've just found it. William de Mongluthe, William de Trenewithe, those names are Norman. Ooh! It's a bit lower than I thought. Oh, look. It's in Cornish. 'but Tim will always have quiet moments in church. and ask fate to be kind to me. And sometimes, prayers are answered. and the coastguard report reckon it's really nice! Is it goodbye to the Helford today? Oh, I think so. I can feel it, I can feel it, yeah. that we should leave two hours after high tide. which means I'll have to navigate round the notorious Lizard Point. Right, this is when we come near the Lizard. a giant that used to frighten me, and make me lose sleep. The Lizard might be a dragon we cannot defeat. # Children, have you ever met the bogeyman before? Hi, Mr Munson. It's Timothy Spall trying again. but he's either not there or he's busy. -You'll have to call him on the radio. "No, bugger off!" I hope not. Here we go. And may God be with us. Even though we've been trapped here for months, it's not easy to leave. I'm sad, I'm really sad. We've had such a lovely time. Good luck, have a good journey. so we've gone through a whole season on the Helford River. As beautiful as this place is, it's time to go. Beautiful sailing yachts, beautiful countryside. I'm very nervous, actually. Quite scared. it's an adventure, but it's supposed to be fun. to continue this adventure, is a compulsion. and we are making our way to Newlyn, over. But I hope it's a compulsion that doesn't lead to my ultimate demise! some of most dangerous seas in the world here. Cor, look at her wash! Actually, if you have any trouble, we can always call out the barge! I can't bear it, look, those eyes! It's like a fantastic, loony conquest. 3,000 miles away is the piece next land. They all think we're mad, but they're not stopping us. Three-part documentary series featuring one of Britain's best loved actors, Timothy Spall, as he and his wife sail from to Cornwall to south Wales in a Dutch barge. The first programme sees Timothy and Shane set off in the Princess Matilda from Fowey in Cornwall, heading towards Land's End. By his own admission, Timothy is an unqualified and slightly nervous mariner, but Shane has every confidence in his sea-faring abilities. The intrepid crew encounter a battleship on what could be a firing range, before getting holed up in the Helford river due to bad weather, which gives them an excuse to meet the locals and witness a lively festival. But all the time Timothy is fretting over the next leg of his journey, which sees the Princess Matilda circumnavigate the infamous Lizard Point, known as the graveyard of ships with its dangerous rocks stretching four miles out to sea.